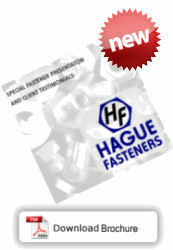 Hague Fasteners is a privately owned company which was conceived in 1971. We are manufacturers of all types of threaded and milled special fasteners in many different types of material, experts in Bolt & Nut manufacturing. We occupy a specific niche in the Fastener marketplace,manufacturing and supplying the more difficult to obtain fasteners, the items that are not readily available from general fastener stockists. We manufacture any item that you cannot buy off the shelf in small to medium batch quantities, from single prototypes through 5pcs, 10pcs, 25pcs, through to several hundreds where required, often in difficult materials and to Customers unique designs and OEM drawings. Our considerable stocks of high integrity steel and Superalloy bars enable us to offer Standard, Modified Standard and Custom Designed Special Fasteners on a very short lead time, in hours where required. With over 45 years of UK Bolt & Nut Manufacturing, Hague Fasteners have an enviable reputation as one of the most reliable manufacturers of Special Fasteners and Custom Bolts to Drawings and Unique Designs. Our extensive Website shows the extreme diversity of Special Fasteners that Hague Fasteners can manufacture. Our LIVE Special Fastener Gallery showcases updates of the latest Special Fasteners products we have manufactured. Please take a few moments and browse our Special Fasteners Website to see how we can be your Special Fasteners Solution.